Come now Clayton, there certainly can be 'too many' radios. How about when the ham has to buy the house next door to house their collection! More than one is too many. But keep enough ready cash around in the event that the one you have smokes. Then use the money to buy a new one. It will be the latest belled and whistled model (if that means a lot to you). What is the point of having ten, ten-year-old rigs crushing your operating desk? The above does not apply to cheap QRP rigs, hi. New here at eHam, and new to ham radio in general. I started "acquiring" equipment 2 years before I took the test and got licensed. Gear was mostly used, and found at bargain prices. hasn't been an exception. What you see is what I "kept" out of bulk buys. Selling what I didn't want or need has kept my actual $ investment very very low. Somebody mentioned an average of "6" radios?....LOL! DC power from the 50 amp PS runs to a RigRunner 8012 distribution panel, and from the 35 amp PS to a RigRunner 4004-USB panel. I'm almost finished with the shack room remodel. Picked up a nice used counter top for $50 and built my own shelf units and painted them to match. Also built a roll out cart to house my computer tower and the massive/heavy RM50m power supply. My coax and ground wires run in via the 2 sections of grey PVC conduit in the corner, kinda keeps things neat and tidy. Think of stamp collections, coin collections, money in the bank. you never have enough same with radios! When it takes an Excel workbook to keep track of them. The question is however, which one does he like best??? :DYou have TOO many rigs when step over Ham goodies in the shack with the latest and greatest rig to add to the collection, and then you realise , you have nowhere to place it!.. Or when the XYL comes into the shack, and whilst watching her face you notice it finally dawns on her that she does not quite remember THAT radio with the screen!.. "Where did THAT come from?" --ooh boy, this is going to be good..
Might be a good time to reduce the clutter..
One radio is one too many for some. When you are wealthy and want to win contests at all costs. Multiple fully equipped operating positions, A farm of large antennas on very high towers and a special building to house the equipment. Being at the top of a contest, with like minded ($$$) people, offers a sense of pride by getting your call sign at the top of a printed page in QST. Perhaps too much equipment is when a small number of these monied stations occupy the top of major contests. 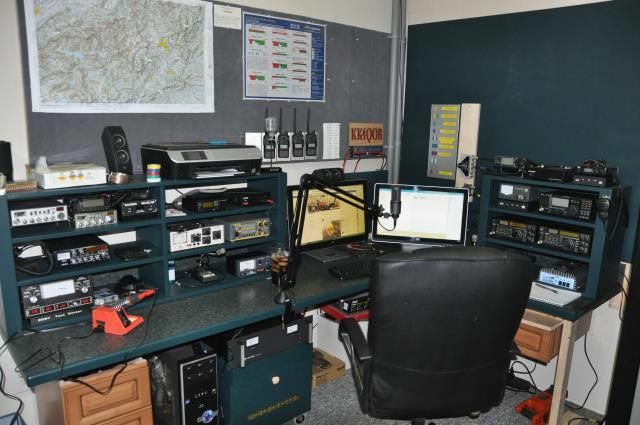 After all, it is these contests that form the new foundation for Amateur Radio. When your local storage facility has no more units to rent to you! One needs at least 6 radios of approximately the same Mode/Frequency coverage. The barest minimum is 3, 'caus if one breaks, your only one radio from having no radio. And if you have 2 and they both work how do you really know that one isn't broken? Or that it's waiting for your weekend to go on strike? So too many would probably be around 10.